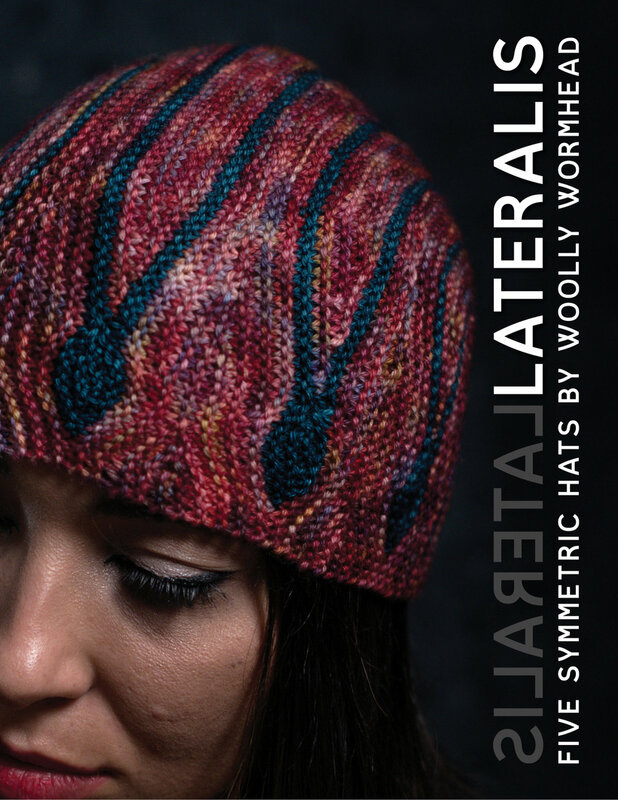 Yesterday members of The Woolly Hat Society received their emails telling them that they can now get their hands on Lateralis! The collection is on pre-order, which means you’ll get a new pattern each and every week until the final eBook is ready. You need do nothing extra - the update notices will be sent to the email address through which you purchased, and you’ll be able to download the latest files. Once the eBook is ready you’ll then get the full and final file. The first pattern available is Duality, which I shared in my last post, and over the next few days I’ll reveal the other 4 patterns. If you’ve already purchased Elemental - either from this website or Ravelry - then the cart system will give you an automatic 30% discount off Lateralis! For this to be effective you need to return to the same place you purchased Elemental (mixed shopping carts make a bit of a mess) and it might be wise to double check in your Ravelry Library that Elemental is there, and which shop you bought it from. It’s important to bear in mind that although my website is a Ravelry store, it’s a distinctly different one to the store you see on Ravelry. I have two separate accounts, with separate records - this was done to enable me to sell in two different currencies and in turn it confuses the system if you mix carts with these types of promotions. That’s why it’s important to go back to exactly the same store. log into Ravelry & check your purchases section - if the purchase shows USD the you bought it via Ravelry, so use that shop. If it's GBP/EUR then you bought it via my website, so buy Lateralis there. you HAVE TO make sure you're logged into Ravelry when you use my website, otherwise the system won't recognise previous purchases! Neither will it add new purchases to your library. the full eBook isn't available yet - you'll get the pre-order file with the release dates & the first single pattern, Duality. Please do read the pre-order file as they contains everything you need to know. if still need to get in touch about a problem purchasing then please PLEASE include your PayPal email & Ravelry username! there's only one of me & I have to pop back to Blighty later today for an important family thing this weekend, so I'll be offline from midday today until midday Sunday (CET) - if you can help yourself with this list or failing that, post in Ravelry, you'll get help much more quickly & reduce the pile-on in my inbox - less stressful all round. If you haven’t already purchased Elemental but want to, adding them together in the same cart should trigger that 30% off Lateralis for you. The 30% off promotion runs until the end of October. Alternatively, you can use bringonthecurves to get 20% off either Lateralis or Duality, on here or on Ravelry. That code is only valid until midnight CET 2nd October, though. I do hope you enjoy these patterns! This collection has taken so long to come together, with various life things getting in the way, and I’ve felt quite out of touch with it at times, to be honest. Part of me is also sick of looking at them, too! But seeing it all come together, with the yarns and photography and graphics tying it all together, I’m excited about them again. The response to patterns has really given me a lift, thank you! The weeks all seem to be running into each other here as I try and battle on through all the red tape. I've been locked out of my new PayPal account for over a week, with no access to funds, because they looked at what I took in the first two weeks of moving the business and decided that I needed to prove who I am and where my business is (I earnt too much, basically, for what they perceive as a new business and they want to rule out fraud). Which isn't easy, as they seem to assume that a business address is also a personal residential address, and my Estonian business isn't yet a month old. Add to that a whole bunch of other things, like being without internet for nearly a week (but now we have broadband!) models falling through (and me desperately trying to find some new and diverse faces), my printed backdrop (and it's reprint) coming through green, not grey, and... well I could go on. I'm really struggling to keep the worst of my depression at bay. BUT! I do have now 5 finished Hats, ready for photography. And I can reveal them, and the details of my collaboration with a brilliant dyer. And here is the first full photo of the Lateralis Hats! I reknit all of the samples, as I quickly came to the conclusion that one of things niggling me about this collection was the lack of colour cohesion. To mix and match hand dyed yarns from different dyers requires a large pool to pull from, and my work stash isn't big enough (I'm working on that). Whilst talking about colour cohesion with a couple of dyer friends, one said she was wanting to put together a range of tonal DK yarns, and working with me would be the nudge she needed. So at Fibre East this year we talked colour and yarn and colour combinations and decided on a selection of 4 tonals and 3 variegated yarn. RiverKnits is the dyer I've worked with, and if you're familiar with Becci's yarns you'll see how the new tonals are so her colour palette. She's made a fantastic job of the new DK tonals and I'm more than happy to be showcasing them here. I tend not to accept yarn sponsorship, as my organic process doesn't always lend itself well to commitments or deadlines (nor does my health, for that matter) but having a complete collection of patterns ready, and with obvious benefits for both parties, this was clearly going to work out well. Becci is busy preparing the new yarn line, and I'm excited to see more DK available. If you pop to her Instagram feed you'll find more details (and do go and have a good look round if you've not come across her before - her dye studio is a narrowboat). This week we're focussing on photoshoots and choosing fonts and style themes for layout. I'll also be doing some last little touches to the patterns, such as matching the colours on the charts to those of the samples, which will add to the cohesion. I've been quite anxious about the shoots, seeing as we've only one of the three planned models, and a backdrop that's the wrong colour (it'll work but it'll mean extra editing time, which in turn means more pain for my shoulders). Our one model will be great, I'm sure, but I'm not sure how well the Hats will suit her. And the face I had envisaged isn't available anymore, which has thrown me completely. I'm really not sure whether this week will be better than the last, but we have at least reached this stage and that's quite something!